We've come to the end of our 39 weeks together, so it's time to do some review so we can see the entire picture in context. "Why would anyone want to learn chords or chord progressions?" The short answer is "understanding." By learning chords and how they are formed and used, we are getting inside of music to see what it is made of. It's like having an x-ray machine that looks deep inside of an object, to see what makes that object tick. And by learning chord progressions, we see how composers link chords together into meaningful segments called "phrases" and "sections." The long answer is that chords and progressions contribute to making a musician complete. It's great to be able to read music, and we certainly should pursue that goal. But if we are lost without music, then we need some music theory understanding to fill in the gaps in our knowledge and understanding. There's a famous story about a world-class concert pianist who when asked to play "Happy Birthday" at a friends' home couldn't do it because there was no sheet music available for it in that home. That's an extreme and pathetic example, but many lesser embarrassments happen every day around the world because piano players don't know theory and don't understand how chords tie everything together. Then we learned that there were also alterations and slash chords -- way too many to list here, because actually there is no limit to the combinations of alterations and slash chords when combined! Then along the way we learned a little about musical forms -- such forms as ABA, AABA, ABCA, and so on. And we learned how the Circle of Keys (also known as the Circle of 4ths and Circle of 5th) impacted chord progressions because of the proclivity of chords to move up a perfect 4th. We also learned that there is a Circle of Minor Keys, and then we combined the major circle with the minor circle to create some interesting progressions. ...and we learned how embedded chord subs could make a progression lots more interesting, and we learned the three most important rules of chord substitutions. Of course. But these are the biggies -- the progressions you will run into time and time again. And so we have come to the end of our time together. I hope you have enjoyed our journey as much as I have. Thanks again, and blessings on you! 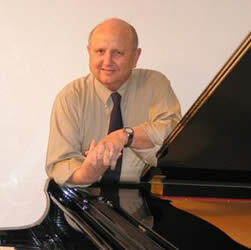 Check out Duane's Course Catalog for all his available piano courses.